Mobile robots can be used in many applications, they are especially suited for environments that are unreachable or too dangerous for humans. In many cases, these environments have to be explored and mapped before robots can carry on with their mission. 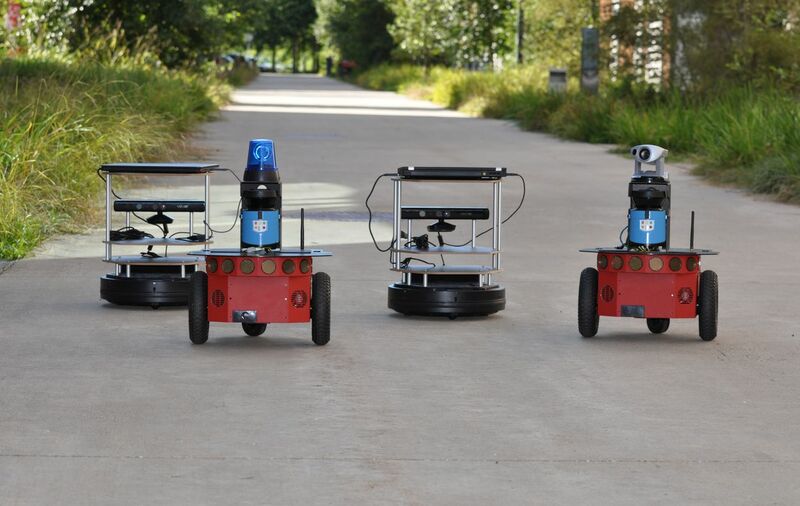 Mobile robots are generally limited in their run time and the travel range because they are battery operated. To increase the time robots can work, their batteries can be recharged at docking stations (DSs). Recharging at DSs has the additional advantage of increasing autonomy, reducing the need for human intervention. Nevertheless, robots still have a limited range they can travel before they have to return for recharging. This limits the reachable area by the robots. To overcome this threshold, robots can form teams in which they take on different tasks, allowing some robots to further explore while others form a supply chain to deliver energy to the exploring robots. There are a number of challenges to solve in this scenario. Firstly, the robots need to be aware of their energy and decide autonomously when to seek a DS or recharger robot. Secondly, exploring robots need to coordinate for deciding which robot is allowed to recharge and where it should recharge. Thirdly, robots need to form teams and coordinate task assignment. All these steps of coordination and scheduling should work in a distributed fashion to make the system adaptive to changes and robust against failures of individual robots. So far we investigated the first two points and developed coordination strategies. In  we present an approach for energy efficient path planning. A robot always calculates the reachable frontiers as well as the distance to the DS. Once there are no more reachable frontiers the robot returns for recharging. This approach makes sure that it fully uses all of its energy without running out of power. In  we present a coordination strategy based on market economy for robots to negotiate which robot is allowed to recharge. We also present policies for selecting one of the available DSs and compare their performance in different scenarios. M. Rappaport, “Energy-aware mobile robot exploration with adaptive decision thresholds,” in Proc. Int. Symp. on Robotics (ISR), Jun. 2016. M. Rappaport and C. Bettstetter, “Coordinated recharging of mobile robots during exploration,” under review.